After going around the Terra Cotta pit #1 twice, I exited through the front exit, and head to Pit #2 located just north of pit #1. Unlike pit 1, the second pit doesn't cotain a massive army, and much of what I saw lie in ruins and is still being excavated. Pit 2 was discovered 20 meters to the north of pit 1, and it was built in an "L" shape. This pit was discovered in april 1976, covering an area of 6,000 square meters. It measures 124m long east to west, 98 meters wide, and 5 meters deep. This pit consists of archers, war chariots, calvary, and infantry. 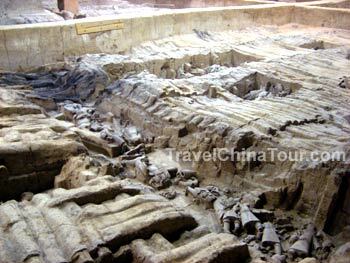 Excavation of pit 2 still continues today, and large areas of the remnants of the roof beams and small sections of terra cotta warriors are exhibited. 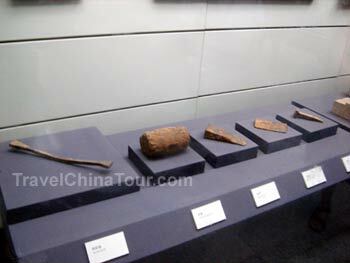 On one side inside the exhibition hall of pit 2, there was a large display area where you can get up and close to view fully excavated terra cotta soldiers that are still well preserved. There was a standing archer, a kneeling archer, a calvaryman standing by a horse, a medium ranking officer, and a high ranking officer. A calvaryman with his horse. In the photo above, is a calvaryman standing beside his horse. 116 of these types of calvarymen with horses were discovered in pit 2. The horses are shown with saddles but no stirrups. The soldier wears a knee length robe, an armoured vest, and tight fitting trousers. 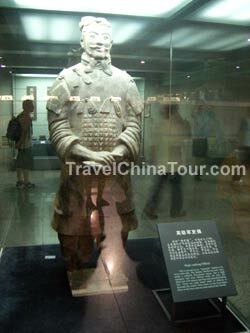 A high ranked officer of the Qin Army. Because this is a high ranked officer of the Qin army, his armour and clothing looks different compared to regular soldiers. 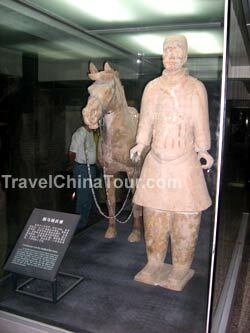 The terra cotta officer soldier shown in the photo above is one of the seven generals discovered in the terra cotta pits. He is tall, wearing doubled layered robes under fish scaled armour. He wears a high headgear tied with ribbons under his chin, and there are eight knots made of ribbons to decorate his armor - 3 knots on the ront plate, 3 on the back, and 1 knot on each shoulder.